I think I mentioned before how I hate the ugly, light brown trim that came with our home. I almost equally hate painting it all, so it is a long, slow process....like I'll do one door and be like ugh I'll do the rest next week - or next year! Anyway, I wanted to do something fun for the laundry closet doors because they can be seen from the bottom of the stairs, and the hallway is pretty boring. So here it is! 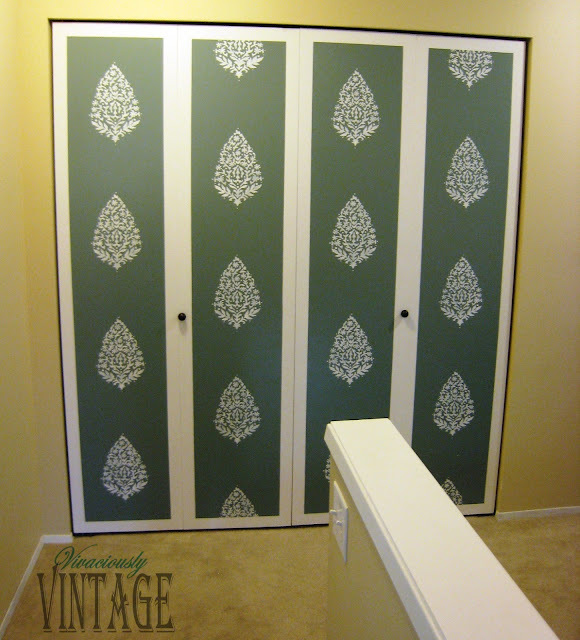 The idea for these doors came from some I saw from Martha Stewart. Except she used wallpaper. I thought that was an awesome idea, but I knew it'd take me forever to find the perfect wallpaper...or I could pay $94 per roll of the kind she used. 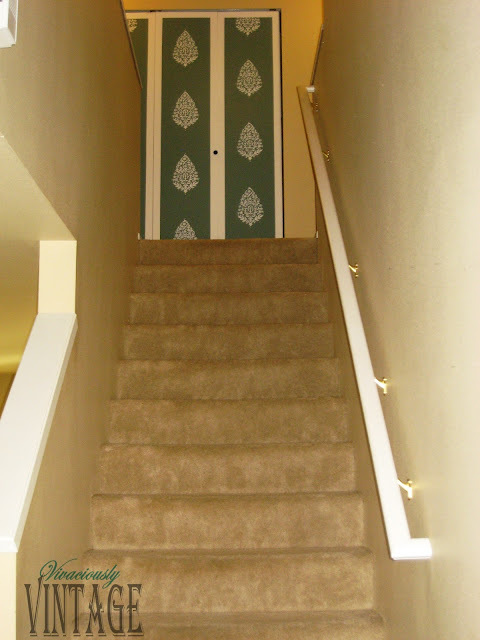 However, I wanted some color in my hallway; so I decided to DIY a knockoff version using paint and stencils. :) I do like how her print is so large, though. This was actually posted as a Tuesday Teaser a while back. I did not get it done within the week. Partly because I procrastinated and partly because I couldn't make up my mind what to do. I ended up following my original plan. First, I painted the doors blue with that white trim, and I was really diggin' that! It looked so tailored and nice. Can you believe I forgot to take a photo of it plain??? After sitting with that for several weeks, I finally decided that I'd go ahead with the stencil. Now it's like artwork! I love the sneak peak of the doors from downstairs! Where did you get the stencil? I can never find any! 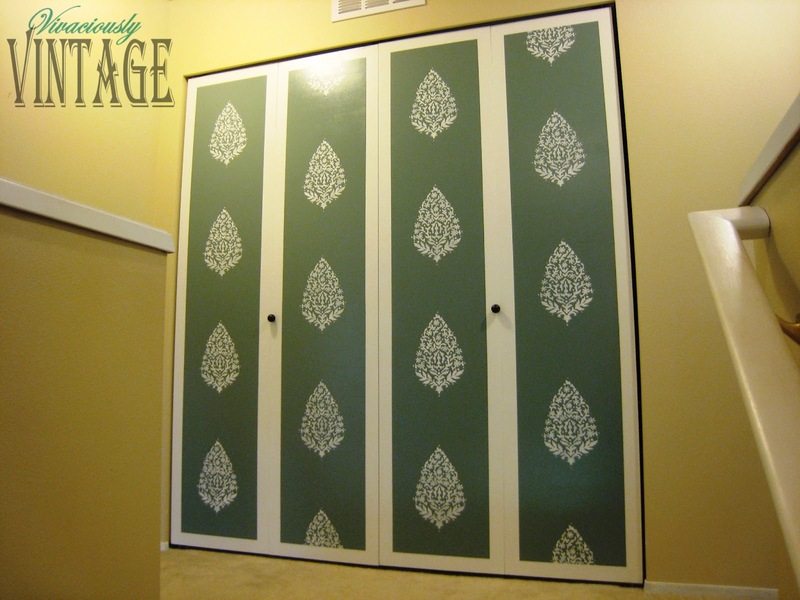 Your doors turned out beautifully! 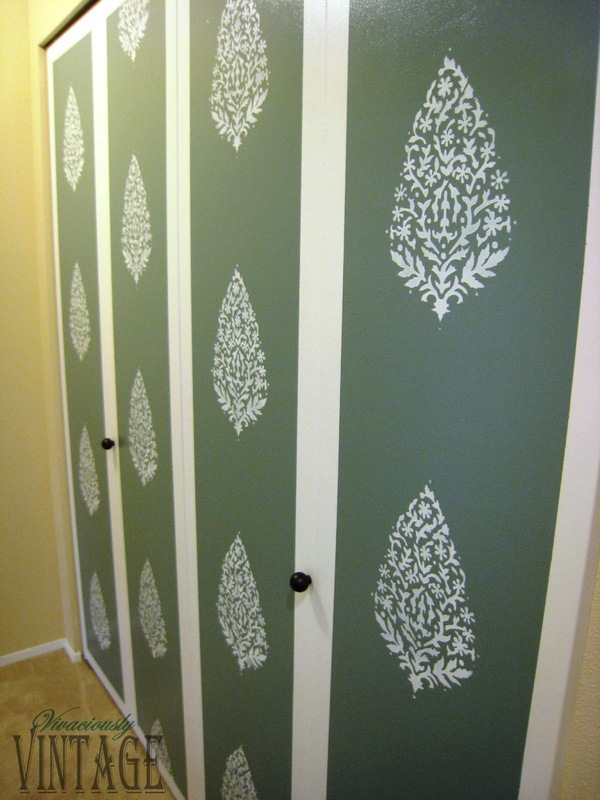 These doors are lovely :) Love the stencil! Who needs Martha at that price?